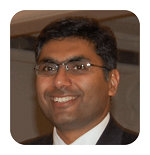 Vikas Khanduja is a Consultant Orthopaedic Surgeon and Associate Lecturer specialising in both arthroplasty and sports surgery aspects of hip and knee surgery and has a particular interest in arthroscopic surgery of the hip. He has been instrumental in setting up the tertiary referral service for Young Adult Hip Surgery in Cambridge. Complementing his clinical practice, his research interests centre around optimisation of Arthroscopic management of Femoroacetabular Impingement. In particular, he has been working on disease stratification of FAI using novel imaging techniques, better pre-operative planning tools using dynamic analysis of the hip and optimisation of arthroscopic management of FAI via precision surgery using navigation to improve outcomes. He is also the PI for the first cell based therapy Phase III trial for Avascular Necrosis of the femoral head PREOB®-ON3 in the UK. He has authored over 100 peer reviewed articles and 2 books – Pubmed. Mr. Khanduja is the recipient of the American and British Hip Society Travelling Fellowship in 2011, the Arnott Medal presented by the Royal College of Surgeons of England in 2013 and the Insall Fellowship presented by the American Knee Society and Insall Foundation in 2014. Mr. Khanduja sits on the Board of Directors for SICOT as Chair of the Education Academy, the British Hip Society as the Chairman for the Non Arthroplasty Hip Register (NAHR) and the NIHR MSK NSG as the Orthopaedic Lead for the Eastern Region. He is also the Associate Editor to the Bone and Joint Journal. 10;5(4):357-361. doi: 10.1093/jhps/hny046. eCollection 2018 Dec.
Joint J. 2018 May 1;100-B(5):559-565.
controlled trial. Int J Med Robot. 2017 Dec;13(4).